[PA-NJ Glassblowers] SCC is now accepting applications for the position of "Scientific Glass Technology Instructional Chair"
[cid:image001.jpg at 01D2FBD5.DD5BC330]SCC is now accepting applications for the position of "Scientific Glass Technology Instructional Chair". The complete listing can be found at https://workforcenow.adp.com/jobs/apply/posting.html?client=salemccedu#. 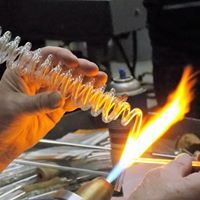 "Salem Community College (SCC) is seeking the right person to coordinate its Scientific Glass Technology Program which is housed in the SCC Glass Education Center. AA in Glass Technology, Bachelor's Degree in a scientific or art discipline, and teaching/training experience (preferably at a college level) required. Capability of overseeing and teaching borosilicate and quartz applications for production and R&D process technology. Responsible for further development of a growing curriculum as well as maintaining and establishing relationships with industry and practitioners. Must be able to demonstrate excellent interpersonal skills and ability to manage resources."